The allegation that BP put profits ahead of the environment shouldn’t be a surprise. In fact, BP’s failure to stop the worst oil spill in U.S. history is indicative of a much larger problem with companies that have embraced one of the central ideas in management today: stakeholder theory. The idea that companies can meet the needs of “stakeholders” leaves them open to moral abuse without normative principles at its core. It was R. Edward Freeman’s 1980 book Strategic Management: A Stakeholder Approach that developed stakeholder theory into management practice arguing for a widening of managerial focus away from the exclusivity of stockholders to include any individual or group having an interest or is affected by organizational activity. In its broadest terms, stakeholder theory helps managers create organizational mechanisms and procedures for dealing with social issues in a proactive, rather than a reactive, way of achieving economic gains. Stakeholder theory is massively popular but without strong normative principles as its foundation, it can be usurped by short-sighted self-interested initiatives leaving ethical considerations excluded from managerial analysis. 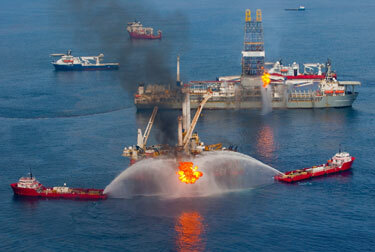 The oil spill in the Gulf of Mexico by British Petroleum is one such example. Preliminary results into the cause of the Gulf spill, according to BP, reveal significant failures of equipment designed to prevent a blowout. To what extent and when BP knew of this equipment failure is unclear, but eyewitness evidence from rig workers claim that BP knew weeks before the blowout that equipment was malfunctioning. Despite BP being unaware of the technological malfunction, according to stakeholder theory, they would have still had to weigh potential equipment failure and environmental harm against cost and profit. From a strategic management approach, BP would have to consider the natural environment as a stakeholder and take steps to incorporate environmental components into their goals, strategies, and structures as a way of achieving an overall company approach. But what is lacking is the ethical content within BP’s strategic environmental management system. Stakeholder theory would correctly identify the environment as a stakeholder but it provides no guidance regarding the ethics of how or what we ought to do in order to protect the environment. From a moral point of view, BP ought to have stopped drilling and fixed the blowout preventer before continuing even if it meant losing money. After all, morality tells us the “right thing to do” often requires us to forgo our own self-interest for the good of others. However, from a stakeholder perspective, nothing requires BP to stop drilling so long as they consider the interests of all stakeholders relative to their own interests. A moral point of view would require a manager to look at other sources for inspiration, such as philosophical arguments, to determine if polluting the ocean with oil is ethically legitimate. Stakeholder theory has many advantages; it allows managers great flexibility to “balance” the “interests” of various groups, individuals, or even the natural environment for mutual gain; it also provides managers clear strategies for dealing proactively with potential negative issues. However, it is still fraught with problems. First, balancing stakeholders is difficult. Determining who is a stakeholder with legitimate interests, given the countless groups and individuals monitoring a firm’s activity, requires a level of analysis that most managers don’t have time for. Second, assessing stakeholders is often based on descriptive, not normative, assumptions. Who is a stakeholder and who ought to be a stakeholder need not be the same; self-interested biases often blind managers to who they ought to include in their analysis but don’t. Third, individuals are often members of more than one stakeholder group and it is unclear how this is to be included into the calculation. Fourth, “balanced” is an especially vague term, falling outside of an objective decision-making methodology. Consider BP, once again. The investigation into the Deepwater Horizon drill rig explosion is accusing BP executives of putting drilling costs ahead of well safety in order to save time and money. Executives agreed to give more weight to cost saving and future profits than environmental considerations, the wholesale loss of the seafood industry, and decades of decimated oceans for future generations. But we shouldn’t be surprised. Given the financial pressures on employees and executives, it is difficult to assume that they will make “balanced”, let alone ethical, decisions under stakeholder theory. The justification of one stakeholder over another usually favours the shareholder, thus creating an unrealistic attempt to “balance” with any success. But we shouldn’t be pessimistic. Stakeholder theory is not inimical to ethics; establishing an ethical culture within organizations with strong ethical leadership must be at the center of any stakeholder assessment. Merck’s helping cure river blindness and its more recent voluntary withdrawal of Vioxx; Johnson & Johnson’s removal of Tylenol capsules after some were tampered with cyanide; Interface’s environmental sustainability; Home Depot’s work with the Forestry Stewardship Council; and Nike’s commitment to improving labor standards overseas, are just a few examples of how normative standards can play a role in dealing with stakeholders and the ethical issues they present. Perhaps the greatest advantage of stakeholder theory, once normative principles are incorporated into organizational decision-making, is that it allows managers to give an unbalanced or biased weighting of issues in order to preserve ethical integrity. That is, it gives managers permission to put other stakeholder interests ahead of shareholders as a way of making the ethical choice for long-term, not short-term, gain. BP should have heeded this advice. Putting the environment ahead of well-costs could have saved BP billions and potentially the company itself. Stakeholder theory can help managers solving ethical problems, such as the environment, and gives managers a practical framework for assessing and balancing interests so long as normative principles are the foundation upon which decisions are made. If only BP had taken this advice to heart. Dr. David Ohreen is an Assistant Professor at the Bissett School of Business, Mount Royal University, Calgary, Alberta.